In the chapel of the Blessed Sacrament inside the Cathedral, 2 Rue de la Manecanterie, 43000 Le-Puy-en-Velay. 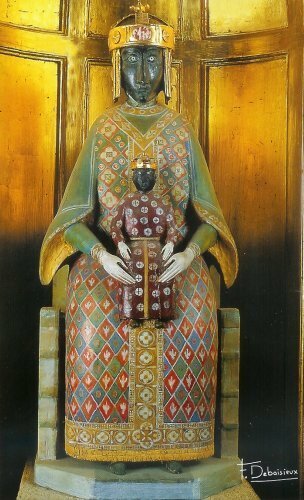 Resin replica of the original painted wooden sculpture, some time before the year 1000. But certain rocks from earth were also sacred. After all, rocks are the most ancient things on earth and one of the names Christians used to describe God was “the Ancient of Days”. (*2) Some criticize Christians for having erased spirit from the earth and its springs, trees, rocks, etc. They say that each kind of stone has a specific vibration, carries energy and spirit. Maybe they are right. Psalms 96 and 98 seem to agree when they sing: “Let the heavens be glad and the earth rejoice, let the sea and what fills it resound; … Then let all the trees of the forest rejoice … Let the rivers clap their hands, the mountains shout with them for joy before the Lord.” Well, I hope the Fever Stone in Le Puy rejoices in its cathedral before the Lord. When Christianity became the state religion of the Roman Empire, in the 4th century, the temple was destroyed. Only the dolmen was left standing. Why? Because, so says the legend, there once was a Christian woman who was severely ill. When she prayed for healing, Mother Mary showed herself to her in a vision, standing on the dolmen and surrounded by angels. One of them told her: “The Queen of Heaven has chosen this place as her domain, to receive and answer prayers here.” The woman was to go lay on the dolmen in order to be healed. She obeyed, laid down her illness on that stone altar and rose again, instantly healed. Henceforth, or maybe even before that, the stone was called the Fever Stone. Mary made it clear that she wanted a church built in her honor on its holy hill. There are different sources telling this old story. Some claim that the bishop of the area at the time was Saint George, others say it was St.Scutaire. 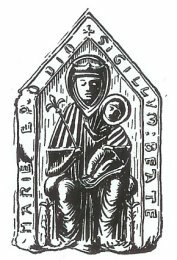 Both were among the first bishops of Le Puy. So when the bishop heard what had happened, he went to see those miracle stones for himself. It was the middle of July, but when he reached the hill it was covered with snow and a stag ran, tracing in the snow the plan for a sanctuary including the dolmen. The bishop knew it wouldn’t be built very soon and so he outlined the stag’s steps with a row of dry, thorny branches. The next day they were all found blooming. In spite of such great miracles not much was undertaken to comply with the wishes of the Mother of God. (I suppose the Church and the Druids didn’t feel as comfortable about mingling their holy sites and ritual objects as Heaven would have them be.) Mother Mary waited patiently for her temple in Le-Puy. After what may have been two decades or two centuries (again the accounts vary) she figured it was time to remind her children of her wish. When a paralytic laid down on the Fever Stone and rose from it healed the Virgin reiterated her desire for a sanctuary that would contain the dolmen. Now the bishop went to Rome to ask permission of the Pope for such a “completely exceptional thing”(*4) as to build a church around a Druidic dolmen and also to move his bishop’s seat onto the pagan holy hill, thereby clearly claiming it for Christianity. Permission was granted and the building completed in 430 A.D. Note how baby Jesus sits sideways on his mother’s left leg, unlike the Seat of Wisdom type of Madonna where he always faces squarely forward and usually sits in the middle of her lap. This is important in consideration of the question whether the earliest Black Madonnas were actually Christianized statues of Isis with her son Horus. I used to doubt this because Horus sits sideways on his mother’s left leg, nursing, unlike the Seat of Wisdom Madonnas, which are usually considered the oldest style of Madonnas in Europe. Here however, we have a trace of an even older Madonna and child closely resembling Isis and child. But let’s return to our story: Once the church was completed, the bishop turned again towards Rome in order to obtain all that was needed for the consecration, including relics. But the Virgin basically told him that she didn’t need Rome (though Rome needed her). She sent two angels to bring the bishop and his companion back home. The angels appeared in the form of two old men who gave the bishop the necessary relics and said, “Go back to Anis; we will go ahead of you and take care of everything.” With that they disappeared into thin air. When the bishop reached the church, he found it bathed in an other-worldly light and the bells ringing on their own. That’s why it is said that the church was consecrated by angels. In the 8th century a violent iconoclastic movement swept through Christendom, coming from Byzantine lands. It sought to root out anything resembling an “idol” and remnants of pagan worship in the Church. That’s when the ancient dolmen was cast out of the church and destroyed. Only the top slab was saved by using it as pavement near the entrance of the cathedral. Yet a thousand years could not erase the memory of this sacred stone and it was finally was brought back inside in 1998. Now a crucifix hangs above it and behind it on the wall we read a quote from the Bible: “Woman, behold your son... Behold your mother.” (John 19:27) So as you lay on the fever stone under the cross, you are in that place where the Crucified gives his mother through John to all his disciples. It's up to you to receive her. Not a trace is left of the first Mary statue installed in the original oratory of Le Puy. According to tradition the one on the facing page was given to the sanctuary, by King St. Louis IX. Others say it was the gift of some unknown crusader in the 12th century. The faithful maintain that a certain Jeremiah sculpted her, some insist the Prophet Jeremiah, others a Coptic monk by that name. In any case, they say that the Lady became a treasure of the Grand Sultan of Babylon, ruler of Egypt, who gave her to a French king during the Crusades. In the Revolutionary year 1794 Our Lady was burnt like a witch on an execution pyre in the public square to cries of, “Down with the Egyptian!” Luckily a certain Faujas de Saint-Fons had created a detailed drawing and description of her in 1777, after which this replica was sculpted. In his opinion we are looking at a very ancient statue of Isis and Horus, which the eyes of Catholic faith see as Mary and Jesus. This Lady now resides in the beautiful Chapel of the Blessed Sacrament because another Black Virgin took her place behind the high altar after her execution. *4: The words of an older version of the website of the diocese of Le Puy. *5: Depicted in “Les manteaux de Notre-Dame du Puy au long de l’année”, a booklet published by and sold in the sanctuary.